Thanks to all the below exhibitors for making the 2018 show so successful! Contact us if you are interested in taking a stand at this year's show. Quincy Coleman demonstrating the AMCS MIDI music sequencer and operating system. Jason Nicholls will be on hand to tell you about the user group for all past, current and future users of Acorn Atoms, Beebs, Electrons and Archies. Adrian Lees will be talking about developments of Aemulor, the 26-bit emulator for running old software on the ARMX6, Titanium and Raspberry Pi, and the graphics acceleration system Geminus. Anthony Bartram is hoping to release a new game, provisionally titled "Stunt Racers", at the show, to add to the eight games already in AMCOG's collection. He will also be demonstrating his Software Development kit and the RDSP sound synthesiser, and encouraging everyone to get developing on their own games!. The subscription magazine for all users of RISC OS software and hardware is celebrating its 30th birthday this October! Pick up the latest issue or get the DVD with 30 years of articles in an easily searchable format. Several years ago Paul Emerton obtained the BBC's remaining Special Projects Archimedes and RiscPC machines and media. These systems were used for producing graphics for titles and quiz show scoreboards during the 90s. See the restored machines in action and create your own winning Lottery ticket! Chris Morley will have an assortment of modern hardware upgrades for the Beeb, such as BeebSCSI mini and the Gotek virtual floppy drive. He will also be showing his full motion video on a Beeb over the Tube demo. Donate your old hardware and software, and buy others to help raise money for Combat Stress. Chris will be selling his new family tree generator program, FamTree. He will also be showing the latest version of his Raspberry Pi based portable GPS unit with PaPiRus display, OLED display, and GPS module, with internal LiPo battery. It can record a GPX route and read it into RiscOSM to analyse speed profile etc. The dealer with it all - if it's not in stock, it probably doesn't exist! Including the RapidO Ti and RapidO Ig desktop systems, the RaspberryRO Lite, and the recently updated laptop, now with HD screen, the Pi-topRO v2. Grab a chance to play with one of the increasingly rare working BBC Domesday Systems, the innovative 1980s multimedia project that aimed to create a modern version version of the 11th century Domesday Book. See it on the VideoNuLA stand, courtesy of Rob Coleman. Chris Dewhurst with the latest issue of the PDF based magazine and bundles of the past issues. Also check out his range of programming books on CD. Nigel Willmott with the latest updates to the personal management software. The RISC OS friendly ISP will be on hand to talk about internet services and data centres. R-Comp will be demonstrating their ARMX6, mini.m and TiMachine native ARM based RISC OS systems, along with RISCube/RISCbook family of VirtualRPC computers, plus the latest updates to their extensive software collection. Andy Marks will have RISCOSbits' ever growing range of interestingly named hardware addons for sale, including BURP, PiSSDup and the brand new smallest ever(?) RO machine, the si.zeRO. Andy will also have Ident Computers new modular system, the CE, on display. Talk to him for all your Acorn and RISC OS Spares and Extras needs. The crowd-sourcing organisation helping to fund developments of RISC OS and its applications will be on hand to report on progress, answer questions, and hopefully sign you up. Charged by Castle RISC OS Developments with maintaining the Shared Open Source RISC OS, ROOL will be demoing latest developments, talking about future plans and showing off their updated documentation. The rise of the machines! Neil Fazakerley will be have the usual gaggle of robot arms to play with, a hands-on motor control demo via GPIOs, a 3-axis gyro box, an SPI-controlled digital readout and led array, and possibly a 3d printer in action making buggy parts. 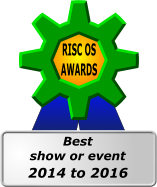 The RISC OS User Group Of London, the show organisers, will be on hand to try to tempt you to its upcoming meetings and talk about RISC OS in London in general. Current RPCEmu developers, Matthew and Peter Howkins, will be demonstrating the latest version of the cross platform Risc PC emulator and answering questions about their future plans. Sine Nomine will have their award winning vector map rendering application RiscOSM available, as well as the latest versions of the Impact Database, DrawPrint, SuperDoku and House of Cards. Vince Hudd will have the latest edition of the Soft Rock Software Collection on sale. Featuring all of the RISC OS applications, games, and utilities currently available from the Soft Rock Software website, plus bonus extras! The last few of his RiscPC styled case for the Raspberry Pi, the RiscPiC, will be available - grab one while you can. Steve will be bringing some ongoing projects to show and discuss, as well as demonstrating BBC BASIC addon Basalt. The search for the smallest RISC OS harware goes on with the PIP5 for the Motorola Lapdock, the PIP Mini the smallest network enabled RO Pi and the PIP WiFi the smallest WiFi enabled RO Pi. Crunchie is a new, but unfinished, BASIC cruncher with some novel features, and Region is a new way to handle international aspects. Steve will have all the latest versions of his software, CashBook, PrintPDF, and Locate2, on sale for a good cause. Come along and try out Tricky's (Richard Broadhurst) new games for the BBC Micro, and maybe give your old favourites a go too. See BBC Micro graphics like you've never seen before with Rob Coleman's VideoNuLA board that upgrades the palette to 4096 colours. Also see how to use a Raspberry Pi as a Tube co-processor to emulate all those second processors you could never afford. Rob is also bringing along a working BBC Domesday system.